We’ll provide some insights and review some of our value DFS defense picks for week 4. Indianapolis Colts – Salaries: DraftKings (DK) – 2200, FanDuel (FD) – 3600. The Colts’ salary ranks them 23rd/20th on DK/FD, respectively. The betting lines with the Texans has the game total at 47 points with the Colts as -1.5 point home favorites. The Colts’ implied team total is currently at 24.25 points and the Texans are currently at 22.75 points. Against the Texans last week, the Giants’ defense logged 3 sacks, 1 pick, and a fumble recovery. The Giants’ defense scored 7 fantasy points which ranked them 13th (tied). Through the first three weeks, the Texans have given up the 8th most sacks (tied) with 10, allowed 5 giveaways, and rank 22nd (tied) in points with 19.7/gm. The Texans also rank 17th in fantasy points allowed to opposing defenses. Last week, the Colts’ defense tallied 5 sacks, 1 pick, and 1 fumble recovery at Philadelphia. The Colts defense scored 10 fantasy points, ranking them 7th (tied) last week. The Colts rank 4th (tied) in sacks with 10 and also have 5 takeaways. The Colts’ defense is averaging 8 points/gm ranking them 11th (tied) and also rank 11th in total fantasy points allowed/gm. The Colts defense is turning out to be better than preseason expectations and is looking like the strength of this team. 2nd round rookie LB Darius Leonard has been dominating, as he leads the league in tackles and solo tackles. DE Margus Hunt leads the league in tackles for loss with 8 and Leonard ranks 2nd with 7 (tied). They each have 3 sacks and a fumble recovery as well. They will get to tee up against one of the worst offensive lines in pass protection. The Colts’ defense is a cheap, sleeper play that could out perform their salary rank this week. Tennessee Titans – Salaries: DraftKings (DK) – 2300, FanDuel (FD) – 3500. The Titans’ salary ranks them 20th/21st on DK/FD, respectively. The betting lines with the Eagles has the game total at 41.5 points with the Titans as +3.5 point home dogs. The Eagles ‘ implied team total is currently at 22.5 points and the Titans are currently at 19 points. At Philadelphia last week, the Colts’ defense logged 5 sacks, 1 pick, and 1 fumble recovery to finish as the #7 (tied) defense with 10 fantasy points. The Titans’ defense recorded 3 sacks, 1 fumble recovery, and held the Jaguars to two field goals at Jacksonville last week. The Titans finished as the 6th ranked defense with 12 fantasy points. The Titans’ defense ranks 4th in points allowed with 16.7/gm. Through the first three weeks, the Titans’ defense is averaging 10 fantasy points per game ranking them 6th, and they also rank 7th in total fantasy points allowed/gm. Currently with the 3rd lowest game total on the board, the Titans are another cheap option in a decent spot. 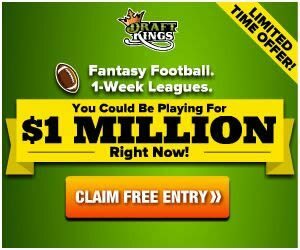 Detroit Lions – Salaries: DraftKings (DK) – 2500, FanDuel (FD) – 3500. The Lions’ salary ranks them 12th/21st on DK/FD, respectively, making them a better relative value on FD. The betting lines with the Cowboys has the game total at 43.5 points with the Lions as +3 point road dogs. The Cowboys’ implied team total is currently at 23.25 points and the Lions are currently at 20.25 points. Against the Cowboys last week, the Seahawks’ defense recorded 5 sacks, 2 interceptions, a fumble recovery, and held Dallas to 13 points. Seattle’s 15 fantasy points ranked them 3rd last week. The Cowboys’ rank 25th in fantasy points allowed to defenses. The Cowboys also rank 31st in pass yards per game with 145 and points scored per game with 13.7. Dallas allows the 7th most sacks with 11, while Detroit’s defense ranks 4th (tied) in sacks with 10. The Lions’ defense logged 2 sacks, a pick, and held New England to 10 points last week. The Lions’ 8 fantasy points ranked them as the #10 (tied) defense last week. The Lions’ defense gets an unimposing matchup at a cheap price. Chicago Bears – Salaries: DraftKings (DK) – 2600, FanDuel (FD) – 4300. The Bears’ salary ranks them 10th/6th on DK/FD, respectively. The betting lines with the Bucs has the game total at 46.5 points with the Bears as -3 point home favorites. The Bucs’ implied team total is currently at 21.75 points and the Bears are currently at 24.75 points. Against the Bucs last week, the Steelers’ defense recorded 3 sacks, 3 interceptions with one returned for a TD, and a fumble. The Steelers’ 17 fantasy points ranked them tied for 1st last week. The Bucs’ offense ranks 1st in yards per game with 473.3 and 3rd (tied with the Rams) in scoring with 34/gm. The Bucs’ also cough up the 5th (tied) most turnovers with 6. The Bears’ defense logged 4 sacks, 3 picks, a fumble recovery, and held Arizona to 14 points last week. The Bears’ 13 fantasy points ranked them as the #5 defense last week. The Bears are tied for 1st with the Rams in fantasy points scored for the season. The Bears’ defense ranks 1st in sacks with 14 and defensive TDs with 2. The Bears’ defense also ranks 2nd (tied) in takeaways with 8, 5th in yards allowed at 289/gm, and 8th (tied) in points allowed with 18.3/gm. This will be an interesting “rock vs. hard place” matchup, but the Bears have multiple paths to success as home favorites in what could be a volatile game.